I ADAPTED JUNIOR’S RECIPE TO MAKE A CRUSTLESS AND GLUTEN FREE VERSION FOR MY POPS! I LIGHTLY BUTTERED AND 8 1/2 INCH SPRINGFORM. WRAP IT IN FOIL AND PLACE IN A LARGER PAN FOR A WATER BATH. ONCE READY TO BAKE, FILL THE PAN WITH HOT WATER SO IT COMES 1 INCH UP THE SIDES OF THE PAN. PREHEAT 350. 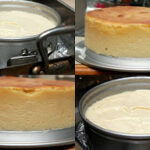 BEAT 1 PACK OF CREAM CHEESE WITH 1/3 SUGAR & CORNSTARCH ON LOW 3 MINS. ADD THE REST OF THE CREAM CHEESE AND BLEND. TURN MIXER TO HIGH AND ADD THE REST OF THE SUGAR. ON MEDIUM, ADD THE EGGS, VANILLA AND HEAVY CREAM AND COMBINE JUST UNTIL BLENDED. BAKE 60-75 MINUTES. MINE TOOK 75MINS LAST TIME I MADE THIS AND 90 MINS THIS TIME SO CHECK CAREFULLY. COOL AND THEN CHILL FOR HOURS OR OVERNIGHT. ONCE CHILLED, CUT A SLICE, INSERT A POPSICLE STICK AND FREEZE FOR 30-60 MINUTES. 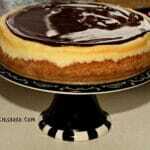 MELT CHOCOLATE CHIPS OF YOUR CHOICE AND DIP THE CHEESECAKE. ADD TOPPINGS WHILE WET AND RETURN TO THE FREEZER TO SET. ONCE FROZEN, ADD A WHITE CHOCOLATE DRIZZLE IF DESIRED AND ENJOY! Are you kidding me!!!! Amazing. I’d eat them all, I’m sure. Thanks for the recipe. I’m so making this! Hi there! My name is Jessica, and I run a food blog called Floptimism. Every Saturday, I write a Weekend Wrap-Up post, where I share some of my favorite web-finds from the past week. 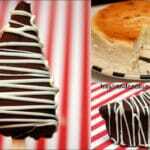 I wanted to let you know that I thought this was such a fabulous idea (I saw cheesecake on a stick at a state fair this year and haven’t stopped thinking about them since! ), that I included it in this week’s wrap-up. I’ve included the link to the post in case you’re interested. Thanks for such a fabulous idea! Just an FYI Southern Eats & Sweets on Facebook is using your images as her own. And I cannot find any citing or credit given to you. Just thought you night want to know. THANKS A MILLION!!!!! I JUST FOUND IT!!! I have to make a dessert for New Year’s Eve……..this sounds AMAZING!! Can’t wait to bring them to the party. 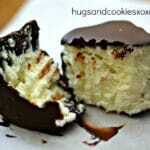 I just tried this and mt chocolate wont stick to the sides. It just breaks off what am i doing wrong? hmmmm, that is strange-what kind of chocolate? Kind of a stupid question. …. do you serve frozen or do you move to the fridge once set up? Thank you for the delicious recipes! Can these just be kept refrigerated (not frozen)?